The UC Santa Cruz Science Communication Program will award students a M.S. degree in science communication starting in fall 2018. The internationally recognized science writing program has previously led to a graduate certificate. The switch from certificate to master's degree does not involve any changes to the curriculum and was approved by UC President Janet Napolitano. "The review committees unanimously recognized that the program is deeply rigorous and the preparation and training are substantive enough to warrant a master's degree," said program director Erika Check Hayden. "This decision is a testament to the work that [previous directors] John Wilkes and Rob Irion have done in building this program, and a lot of credit also goes to the instructors, students, and alumni whose work has earned our international reputation as a leading science journalism program." Although the lack of a master's degree hasn't limited the careers of the program's previous graduates, Hayden said the question always comes up in conversations with prospective students. "In journalism, the type of degree you have doesn't matter much. But there are lots of different kinds of careers in science communication now, and for some of those a master's degree might be helpful," she said. "This change will boost our ability to recruit top candidates." 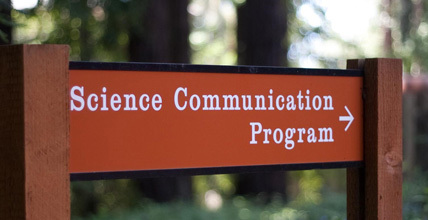 Widely regarded as one of the best science writing programs in the world, the UCSC Science Communication Program focuses on practical training through rigorous coursework and diverse internships. It is the only graduate science writing program in the United States that requires a degree in science and experience in research. Graduates of the one-year program work as writers and editors at the nation's top newspapers, science magazines, online and broadcast news services, research agencies, universities, and medical centers. Hayden also thanked the Physical and Biological Sciences Dean's Office, and in particular assistant dean Carrie Haber, for helping to shepherd the program's proposal to convert to a master's degree through the approval process at the campus level and at the UC Office of the President, and for the division's support of this unique program. "What makes the program special is the way we combine real-world experience and classroom learning to prepare students for lifelong careers," Hayden said. "I am thrilled with the students we're seeing these days, especially the diversity of applicants we're getting and the variety of career paths we see our alumni engage in. The master's degree will help continue and accelerate this positive trend."